Kayla is awarded an NSF GRFP! Takuma is awarded an NRSA from NEI! Congrats Takuma and thanks to NEI for the support! Thank you to the Lighthouse Guild for this honor! 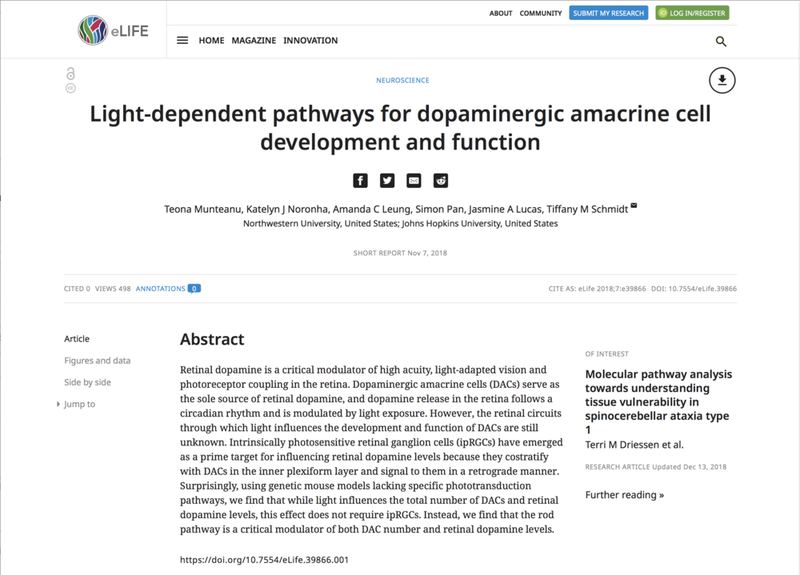 The lab's first preprint is uploaded to BioRxiv! Teona’s paper is out on eLife! With an assist from Jasmine, Amanda, and Katelyn! Uma is accepted into the NEURON program! With Takuma as her NEURON mentor. Takuma wins the Trainee Professional Development Award from SfN! Takuma's paper is previewed in the August 22nd issue of Neuron! Yudai and Eric present posters and Uma and Sam give talks at the Neuroscience Research Symposium! And Yudai won Best Poster! Congrats to all for great work this summer! Takuma's paper is published in Neuron! With an assist from Seul Ki. Congrats! Ben Gerber starts as a technician! Welcome to the Schmidt Lab! Jenny's paper is out at Journal of Comparative Neurology! Katelyn wins a Conference Travel Grant to attend the FASEB Retinal Neurobiology and Visual Processing Meeting! Sam, Yudai, and Uma win Summer Research Grants! Sam and Yudai received Summer URGs and Uma received a Neuroscience Summer Research Grant. Congrats! Kayla Miguel officially joins the Schmidt Lab! Welcome! Sam wins an academic year URG! Katelyn wins an academic year URG! NUIN student Kayla Miguel starts her rotation in the Schmidt Lab! Michelle crushes the Circadian Data Blitz and presents her poster at SfN 2017!